The first Museum was founded in 1935. The extension of the new Piraeus Museum was carried out in 1966. A fine collection of sculptured grave monuments of the 5th and 4th centuries B.C. 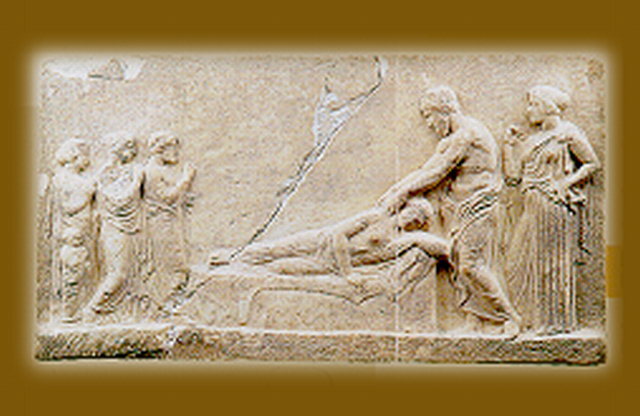 Dedicatory reliefs of the 5th and 4th centuries B.C. from Piraeus. A statue of the Mother of the Gods of the 4th century B.C. from Moschato and a shrine (naiskos) from Piraeus. Bronze statues of the Classical period from Piraeus. Pottery from excavations in Piraeus, Salamis and the west coast. Hellenistic and Roman sculpture from Piraeus. Neoattic relief plaques from a shipwreck of the 2nd century A.C. In the picture dedicatory relief to Asklepios, 4th century B.C.